A woman seeks refuge for herself and her daughter in the household of a childhood friend. The friend, Alice Kytler, gives her former companion a new name, Petronelle, a job as a servant, and warns her to hide their old connection. In the months that follow Petronelle learns that in the city pride, greed and envy are as dangerous as the wolves that prowl the savage countryside. And she realizes that Alice's household is no place of safety. 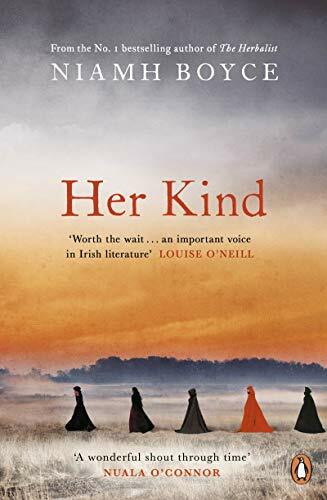 Inspired by a true story, Her Kind is a tense, moving and atmospheric re-imagining of the events leading up to the Kilkenny Witch Trial of 1324. The Kilkenny Witch Trial of 1324 and the story Alice Kytler and her maidservant Petronelle was a slice of Irish history of which I had no previous knowledge. My graduate studies were centred on the 1500's to the the twentieth century but this book has really inspired me to learn more about our medieval past. I found it fascinating that a woman like Alice could be so successful and powerful in her time. She was married four times, was a moneylender and held considerable wealth. Was she typical for her time? How many other women had such powerful roles in medieval Ireland? Unfortunately it was inevitable that the Catholic Church's 'Empire of Misogyny' would clash with women like Alice in Irish society. The story opens with one of the final scenes in the book. The story then jumps back to the events that led to the witch trial. It is told through the voices of three different characters- Alice, Petronelle, and her daughter Basilia. The character I had most sympathy with was Petronelle. She had a very interesting and mysterious background and her main concern was to protect her daughter. Alice Kytler on the other hand was self serving and opportunistic. There is a general feeling of doom all the way through this book. The combination of religious zealousness, superstition and jealousy made for a powder keg ready to explode. The author does a great job of combining historical fact with fictional embellishments and it makes for one riveting and thought provoking tale; one I won't easily forget and will put aside to read again.